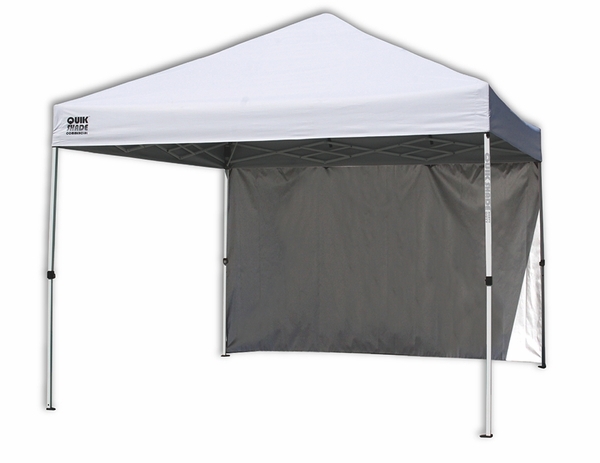 The Quik Shade Commercial 10x10 Instant Canopy with Back Wall Panel is the perfect canopy for your business needs. The durable Aluminex backed fabric offers 99% UV protection over its 100 square feet of shade and the canopy has a heavy-duty commercial grade steel frame that is powder coated for a long life. The canopy has three height settings that are easy to adjust with its patented push/pull leg extenders and sliders. You can transport this canopy to any function with ease, thanks to its durable polyester wheeled bag. Add more shade or privacy as needed with the one removable wall panel, making this canopy a versatile choice for any function. Can we leave it up for the entire spring-summer season? This is a pop-up canopy, and it is not recommended to leave up more than 48 hours, as it is not wind rated. Can additional walls be added to the sides? Is the back wall panel removable? It is indeed removable. Thank you for your interest. What is the height of the valance at the highest setting of the canopy? The height of the valance is 6 feet. What is the denier rating of the canopy? This canopy has a 300 denier top. What is the height and width of the front valance? Per the manufacturer, the valance is around 8 inches high and 10 feet wide. Where does this ship from? This item ships from California. How can this be secured on a paved lot or wood deck? If using this item on a hard surface, it is recommended that you use anchors or weights. We carry the Quik Shade Plastic Weight Plates which can be found here. What are the actual dimensions of the inside of the canopy? The inside dimensions are 10 x 10 (100 Square feet) . The maximum height is 120" (10 ft). Does it come with a roller bag with wheels? Yes, this comes with the wheeled storage bag. Is this commercial grade tent waterproof? This model features a polyester top which is water resistant, but not waterproof. The top will hold up to a passing shower, or a light rain, but the top will eventually become saturated, and at which point you will begin to notice dripping below the canopy top. How does this Quik Shade commercial C100 10x10 instant canopy with back wall panel attach? Thank you for your inquiry. The Quik Shade back wall attaches with Velcro. What is the Aluminex liner of this Quik Shade Commercial C100 10x10 instant canopy with back wall panel? Aluminex is the silver coating under the canopy top that allows for increased UV protection. Is the removable wall panel black or white? The removable wall panel is white. What are the dimensions when folded up? The folded dimensions are 8.3 inches x 8.3 inches x 46.9 inches. How much does this Quik Shade Commercial C100 10x10 Instant Canopy with back wall panel weigh? The shipping weight for this item is 54 pounds. What is the fire rating / certification for this Quik Shade Commercial C100 10x10 instant canopy? This canopy meets the CPAI-84 fire retardancy requirements. Canopy is nice, and looks relatively solid. Not as quick to setup as I thought, but might be because it is new and a little tight. The instructions are accurate, but the images are rather small and just black and white copies. larger images would have been helpful. Also if you decide to take the cover off when you take down the canopy, there is not place to nicely stow it. ProsSeems sturdy, relatively easy to setup. ConsNo stowage for the canopy top. It would be troublesome to setup by ones self. The instructions need larger images to help. Our daughter is a mixed media artist and needed a pop up canopy that is both fast and easy to erect but, can also take the rigours of multiple setups and take downs as necessary. With double reinforcement tresses on the C100 model, this unit does exactly that plus shields her wares from the sunlight. All at a very affordable price. As with all equipment regardless of designation, the equipment has to used for its intended purpose(s) and still has to be cared for and maintained. ProsHeavier frame and relatively inexpensive. SheterLogic (who supports the brand now) has excellent customer service. ConsProduct arrived with a rivet missing on the bag. ShelterLogic customer support immediately replaced the bag (which really is a positive). Very well made and shipped right away. I was looking for a canopy I could use at a bike event I'm going to in July! I decided to try the C100 out! I'm glad I did!!! For the money it is very sturdy!!! I put it up for the first time on Fathers day and was very pleased!! There was plenty of room and we just moved the back wall according to where the sun was!! ProsEasy to handle! Sets up quick! Canopy is good and tight on the frame!! ConsThe ground leg pins are a little small. Get the sand weights for the legs. You really need two people to set up. During a large family get together, we had a few types of canopies set up. We had strong winds and while other canopies had to be taken down, this one lasted the whole time.